the zucchini doesn't loose its shape.Coarsely chop the inside flesh of the zucchini. Set aside. 2.Heat oil in a pan over moderate heat;sprinkle asafetida, then drop the bell pepper, carrots and choppedzucchini flesh. Add the herbs, salt and black pepper. Cookstirring often for 6-7 minutes, or until the vegetables aretender. 3.Preheat the oven to 350 F/180 C. Spoon thefilling into the zucchini shells. 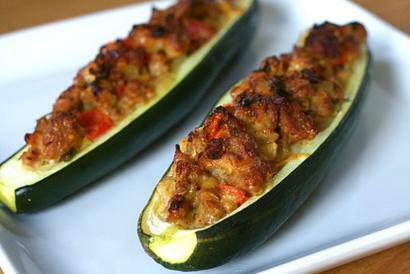 Place on a greased bakingdish and bake for 25- 30 minutes or until the zucchinis aretender. Sprinkle with cheese if desired. Serve hot.